The Boston based ceramicist, Anne Mastrangelo, has been working in low-fire clay for twenty years. 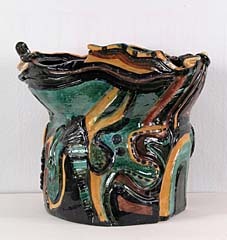 Her pieces are both sculptural and functional, made of both white clay and terracotta. 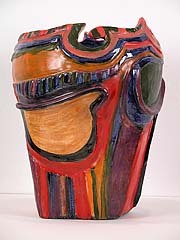 The lively and rich colors and patterns in her work evoke the work of Matisse and African art. They are vibrant and are abstract, as well as representational with imagery ranging from her dog (or yours!) to her garden. Some large pieces seem to be moving in their own space. They are twisted, curved, or cut out. Light plays on the inside and out. All functional ware is non-toxic and food safe, but not to be used as cookware. Most vases can hold flowers and dried flowers. Anne Mastrangelo has been included in numerous group shows, including Kantar Fine Arts, The Dog Show, at Levinson Kane Gallery, Boston, Maverick Studios Group Show, at the Massachusetts State House, East End Gallery, Provincetown, MA, and Local Color, Clark Gallery, Lincoln, MA. Her work is in numerous corporate collections, including that of the Brigham & Women’s Hospital, Boston, MA, Coopers & Lybrand, Inc., Boston, MA, Sonesta International Hotels Corporation, and The Patrons of the Institute of Contemporary Art, Boston, MA. She is represented in many private collections throughout the United States. Anne Mastrangelo is a graduate of the School of the Museum of Fine Arts, Boston, MA, the Lake Placid Center for the Arts, Lake Placid, NY, Massachusetts College of Art, Boston, MA, and the Maryland Institute, College of Art, Baltimore, MD. She has been critically acclaimed by art reviewers in the Boston Globe (Christine Temin, “State House Doubles as Art Gallery,” Jan. 2, 1988), and in the Boston Herald, (Nancy Stapen, “Alpha Maintains ‘Real’ Artistic Dynasty,” Dec. 18, 1987, and “ ‘Local Color’ Show Gives Fine Glimpse,” July 18, 1985).